Why Is a German Prince Skiing For Mexico? Hubertus Von Hohenlohe of Mexico in action during the Mens Downhill at the FIS Alpine World Ski Championships in Bormio, Italy. Last Thursday afternoon, during the ceremonial raising of the national flags at the Vancouver Olympic village, the Mexican national anthem blared over the loudspeaker. Mexico's lone Winter Olympian, alpine skier Hubertus von Hohenlohe, stood at attention, right arm crossing his chest. That's right  Hubertus von Hohenlohe. If you're thinking that name doesn't sound very Mexican, you'd be absolutely correct. In fact, he's a descendant of German royalty, the son of Prince Alfonso Hohenlohe and Princess Ira Fürstenberg. Can't get more Mexican than that. After Olympic officials raised the flags for Mexico, Azerbaijan, Denmark and Great Britain, actress Sandra Oh  a Canadian and star of Grey's Anatomy who was emceeing the event  invited the athletes onto the stage for a festive dance. "We are celebrating you, the youth of the world!" screamed the overcaffeinated star. One problem, Sandra, von Hohenlohe of Mexico is no youth  he turned 51 two weeks ago. With every Winter Olympics, fans eat up the weird stories about the athletes from warm-weather countries that would seem to have no business participating in their chosen sports. And although the Jamaican bobsledders failed to qualify for the Olympics this time, the Vancouver Games offer plenty of intriguing tales. In addition to the middle-aged German skier prince representing Mexico, there's a speedskater from the Cayman Islands, cross-country skiers from Bermuda, Ethiopia and Ghana, and a few other oddballs who marched in Friday's opening ceremony. Even Jamaica still got to raise its flag: a freestyle skier from the country earned a spot at the Olympics. Sure, these stories are charming. Too often, however, the connection between the athletes and the countries they represent is tenuous at best. Though athletes are required to be citizens of the countries they're competing for, that definition of "citizen" varies widely from one country to the next. It's a problem that has spread across a spectrum of sports. A Pittsburgh-bred point guard, who speaks little Russian, suited up for Russia's basketball team during the Beijing Olympics. African distance runners have competed for Bahrain, and American baseball players for Italy. But the tie between country and competitor is especially loose in the Winter Games, since warm-weather places like Mexico and Jamaica can't even claim a speck of snow or ice. Errol Kerr, the Jamaican ski cross athlete, grew up in the Lake Tahoe area. Ruben Gonzalez, a luger with Argentina's team, lives in Katy, Texas; he moved to the U.S. when he was six. Still, no one's Olympic uniform is more confounding than Hubertus von Hohenlohe's. "It sounds strange," von Hohenlohe admits while relaxing in an Olympic Village coffee shop before the Mexican flag-raising event. "But it's not all that bad." The skier's grandmother is half-Mexican, and von Hohenlohe, who is a Vienna-based singer and photographer when he's not speeding down the slopes, was born in Mexico City while his father was running a Volkswagen plant there. "We always wanted to have one member of the family [who was] Mexican," he says. "So they chose that I was going to be born in Mexico. That was the idea." When he was four, however, the prince left Mexico for Spain. He went to schools in Austria, where he took up skiing. 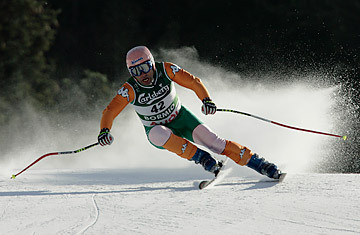 Since he was born in Mexico, von Hohenlohe could still compete for that country; he made his Olympic debut in 1984, finishing 38th in the downhill. This will be his fifth Olympics for Mexico, but only the first since 1994. Although he qualified for the Torino Olympics in 2006, the Mexican Olympic Committee refused to send a one-man team. More eager for exposure this year, Mexico decided to support his next-to-nothing shot at a medal in the slalom and giant slalom races. Von Hohenlohe's family has a house in Cabo San Lucas, but he estimates that over the last five years, he has spent just two to three weeks a year in Mexico. Still, he insists he bleeds the green, white and red colors of the Mexican flag. "I feel very Latin in a way, and Spanish," says von Hohenlohe, who does speak fluent Spanish (as well as French, German, Italian and English). "The Spanish were the ones who came to Mexico in the end, so I do feel Mexican. Naturally I have more ties to Spain, but I'm more of a Latin person. Although our name is very German, and we're a German aristocratic family, we really grew up in more of a Mediterranean way. My look is not very German. People think I'm from Argentina, or, I don't know, Italy. But they don't think I'm from Germany and Austria." The fact is, von Hohenlohe is a talented skier who has somehow met the Olympic qualifying standards at 51  and it was infinitely easier for him to do that as an athlete from Mexico where no one skis, than from Austria, where the sport is a national obsession and the competition is cutthroat. Is von Hohenlohe simply a rich heir toying around the Alps, and using a poor country to reach the Olympics? "In life you have a couple of opportunities and openings," the prince argues. "And one of them was that I was born in Mexico. Sure, I used it to my favor. But not in an abusive way. You try to find that little thing that makes a difference, and take advantage of them. I took advantage of it." Von Hohenlohe also points out that additional athletic exposure can only help Mexico. "I've also created a lot of publicity in European countries for Mexico," he says. "When people are sitting in their houses in Sweden, thinking how cold it is, they think, 'Wow, this guy is from Mexico. Maybe I should go to Cancun or Acapulco to visit it.' I've done a lot for the country too. It's give and take." Still, Mexicans are unlikely to tear up with pride while watching him race. Perhaps he should follow in the snowshoes of Robel Zeimichael Teklemariam, the 36-year-old cross-country skier from Ethiopia. Teklemariam, who was born in Ethiopia but moved to the U.S. when he was nine, competed for his native country at the Torino Olympics despite the fact he hadn't set foot there in 23 years. Yet after those Olympics, a three-week vacation in Ethiopia turned into permanent residence, and he has no plans to leave. Now he trains in Europe, but in the off-season, he roller-skis around the suburbs of Addis Ababa. "This time around, it's a lot sweeter," Teklemariam, who'll be competing for Ethiopia again in Vancouver. "There are so many Ethiopians who supported me to get my funding, to do everything. There's a lot more knowledge of the sport. They even know what snow is." Teklemariam might not win a medal in Vancouver. But when he looked at that Ethiopian flag during the opening ceremonies, at least he knew it was his.